First of all, welcome everybody to my new series, No Strings Attached, where I get to ramble about guitar and guitar strings for all the world to see. For those of you who don’t know me, I’m Scott. I founded Stringjoy in 2014 all on my own, and I’ve been learning more and more every day, ever since. Now in the words of Jay-Z, “I ain’t passed the bar, but I know a little bit.” I don’t know if I’m an expert of anything, but I keep trying different things all the time, and I learn something with every success and every failure. 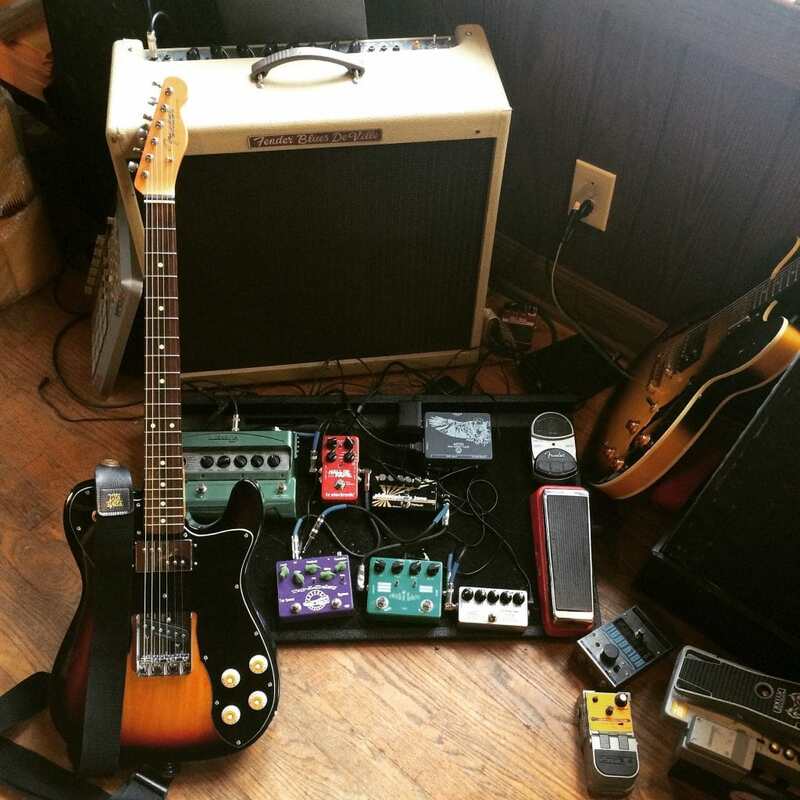 In this spirit, I’d like to tell you about how I came up with my own custom set of strings that I’ve been using for a few months now on my tele, and have been eminently happy with, in hopes that it might encourage you to keep experimenting, and continue pushing your limits every day. My new custom tele, all decked out with its fresh strings. 1. I wanted to start with a .010 gauge. I’ve been playing .011s on my hollow body, and while I like the added tension on that guitar — especially with the shorter 24.75″ Gibson scale — I knew I wanted to be able to bend a bit easier on this tele. Plus, I’ve always felt like .010s are the right tone for a tele, 9s sound way too flimsy, but 11s don’t really bring out the twang the same way 10s do. As some of you might know, I’m a bit of a wound 3rd addict. After all, the guitar was originally intended to have a wound 3rd, it just intonates and holds tune better. One of the biggest reasons I got into customizing my strings was that I thought it was dumb to only be able to get a wound 3rd set in 11s or 12s, when they make lighter wound strings. Anyway, a wound 3rd has always been my favorite way to tame the twang down just a bit on teles — I like it on the top two strings, but it just gets so aggressive on the 3rd string. Above all, I wanted a wound 3rd that was light enough for me to be able to bend it like a plain string, but for it to have all the sonic advantages of a wound string. I’ve always liked the added power of heavier bottom end strings, but I’ve long felt that the traditonal Light Top/Heavy Bottom sets can be a bit too much of you aren’t downtuning. I’ve always like a bottom end that’s midway between a Light set (26-36-46) and a Light Top/Heavy Bottom set (30-42-52). For years I had the hardest damn time finding 28s, 38s, 48s or 50s anywhere, as they’re fairly uncommon gauges to most players, fortunately, I don’t have that problem anymore! I don’t drop-tune too often on my tele, so I wasn’t concerned about getting anything super heavy on the bottom, but I do definitely play in Drop D every so often. There’s nothing I hate more than having a loose, floppy 6th string when you tune down (on most sets you can actually hear the string hitting the frets because it’s so floppy. So, I wanted to come up with a set that would give me enough tension on the 6th string for the occasional Drop D song, without sounding out of balance when I’m playing in standard, which is most of the time. So, what did I end up going with? I went back and forth a few times on the bottom end, first starting with .030 – .040 – .052, then backing off a bit to where I ended up. As you can see in the tension read-out, this gives me a really nicely balanced tone, with just about 5lbs more tension on the bottom 3 strings than I have on the top. For those wondering, this is totally normal and 100% safe for your guitar, though you defintely don’t want to get up to a 10lb differential, for a number of reasons. Well, in a word, great! I couldn’t be happier with this setup. The bottom end is just right for me and balances really nicely with the rest of the set, while also giving me enough power for some intense, and occasionally sloppy, blues playing. Above all, I’m in love with the .018 wound 3rd string. It really feels just like a plain string, but sounds like a wound string—I’m in heaven! More than anything, the moral of the story is that trial and error is the name of the game. You won’t always get it right on the first effort, and that’s OK. It’s worth it in the end to find the perfect setup. If you’re working on building out a set of your own, don’t hesitate to try something different. The worst thing that could happen is you’ll have an experience with something new, which is always good for your playing. As always, if there’s anything we can help with to make the process easier, let us know. We’re always happy to help you find the perfect set.